This is my first time making Jewish Challah bread. I was a little bit nervous for it, as the recipe I’ve used was pretty comprehensive and needed a full 48 hours for best results. If you’re going to attempt this loaf, make sure you start the day before and make your starter sponge as instructed. Make sure you place your starter in a large container! She’s a lively one and she’ll escape on you even if the lid’s on tight, I know this from experience! Challah (plural: challot/challos) (Hebrew: חלה‎) is a special Jewish braided bread eaten on Sabbath and holidays. It is also named khale’ (eastern Yiddish, German and western Yiddish), berches (Swabian), barkis (Gothenburg), bergis (Stockholm), birkata in Judeo-Amharic, vianočka in Slovak language, chałka (Polish), colaci(Romanian), and kitke (South Africa). According to Jewish tradition, the three Sabbath meals (Friday night, Saturday lunch, and Saturday late afternoon) and two holiday meals (one at night and lunch the following day) each begin with two complete loaves of bread.This “double loaf” (in Hebrew: lechem mishneh) commemorates the manna that fell from the heavens when the Israelites wandered in the desert for forty years after the Exodus from Egypt according to Jewish religious belief. The manna did not fall on Sabbath or holidays; instead, a double portion would fall the day before the holiday or sabbath. 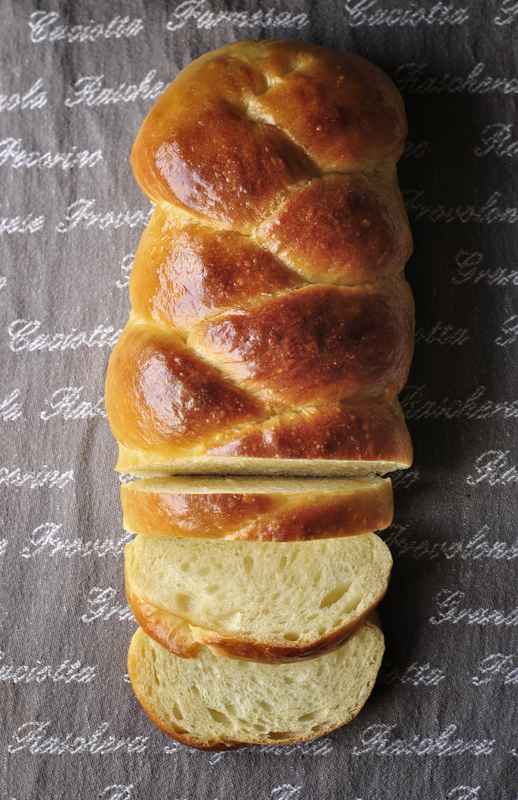 Each single loaf is woven with six strands. Together, both loaves have twelve which represent each tribe of Israel. 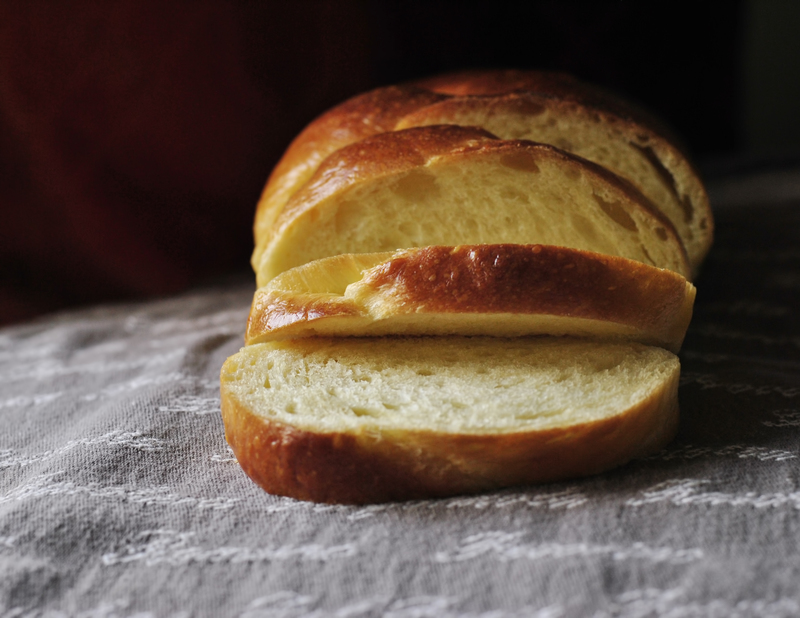 Traditional challah recipes use numerous eggs, fine white flour, water, sugar, yeast, and salt. Modern recipes may use fewer eggs (there are also eggless versions) and may replace white flour with whole wheat, oat, or speltflour. Sometimes honey or molasses is substituted as a sweetener. 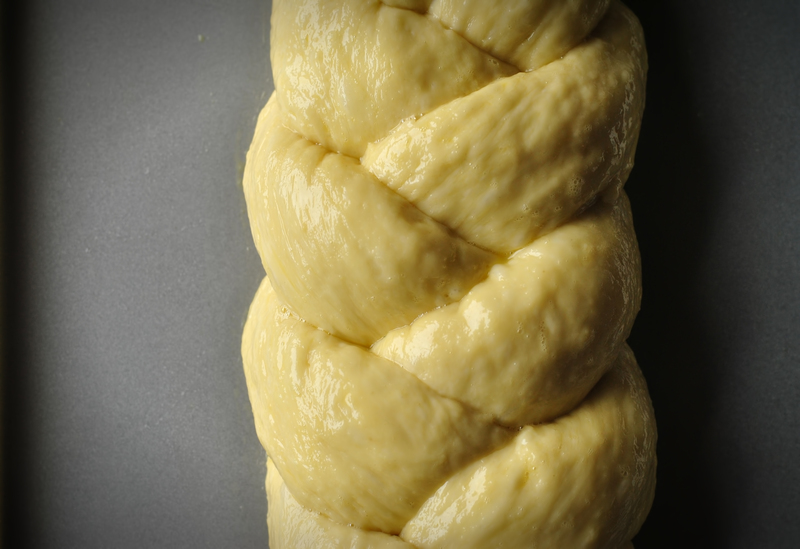 The dough is rolled into rope-shaped pieces which are braided and brushed with an egg wash before baking to add a golden sheen. Sometimes raisins are added. Some bakers like to sprinkle sesame or poppy seeds on top for flavor. 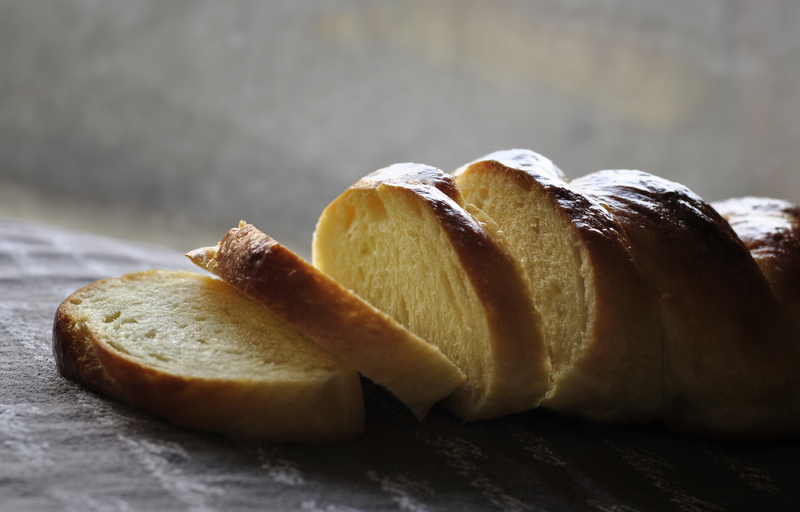 Challah is usually parve (containing neither dairy nor meat, important in the laws of Kashrut), unlike brioche and other enriched European breads, which contain butter or milk. The particular recipe I’ve used here is from The Bread Bible (Rose Levy Beranbaum). To view her site, blog, and cookbooks, click HERE. This Challah recipe is indeed parve, and contains no dairy. Honey is substituted for the sugar, to replace this regular sweetener with an invert sugar to keep it moist a little longer. If you plan to keep the loaf hanging around your kitchen for a few days then definitely use this technique to keep it fresh longer. I’ve also used a simple three-strand braid rather than the traditional 4, 5, or 6, because I am new to this and just wanted to be sure I could get the dough and ‘finish’ correct, let alone worry about the quality of the braid! Maybe next time I’ll be more adventurous. You also need a lot of counter space for a large braid, and this I do not have! -Blend all ingredients with a whisk, seal tight in a large glass or plastic container, leave at room temperature overnight. -If the starter boils over too much and is making a crazy mess, toss her in the fridge overnight and pull out again early in the morning. -Whisk the yeast mixture into yesterdays sponge starter, mix salt into flour, then sprinkle the flour over top of the sponge starter in a large bowl, and leave at room temperature for two hours. The flour will start to look ‘cracked’ on the top as the sponge mix begins to feed off of the flour and bubble up. -Add all remaining ingredients (all the wet stuff) and mix together, scraping all the clumps into the dough until it holds together. Set aside for 15 mins. This will allow the flour to begin absorbing the moisture and will be easier to handle. This is a very sticky dough, you’ll need extra oil on hand for kneading. -Knead the ball of dough on a lightly oiled surface for 2 or 3 mins, until it’s starting to become elastic and smooth. Rest the dough one hour at room temperature. -Repeat this process once again: knead, rest at room temperature one more hour. -Remove the dough, press to deflate/remove air bubbles (but do not knead), cut into three equal portions/strands, and let rest 5 mins to relax. This quick relax will make the strands less elastic and will be easier to braid. -pinch the three strands together at the tops, and proceed to braid them together. If you were never a 12 year old girl and did NOT spend your afternoons making ‘friendship bracelets’, then you can click HERE for braiding instructions on YouTube. If it doesn’t look like this, then I don’t know what to tell you. Practice? I’m sure it looks fine. If you get large air bubbles at this point: poke them with a sharp knife to deflate. If you keep them they will bake into the surface of the bread and the crust won’t be as even and ‘pretty’. The choice is yours. 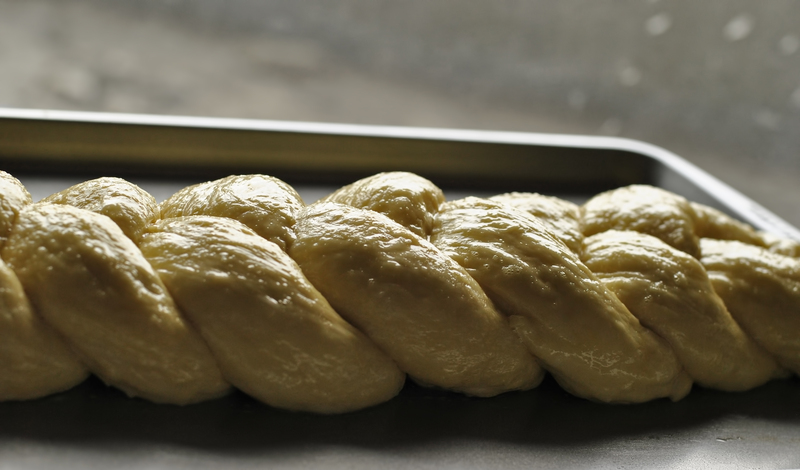 -Preheat your oven to 350 F, and brush the Challah braid with egg wash, resting again at room temperature for one hour or until proofed double in size. -Brush the loaf one more time with egg wash and place in the oven until golden brown. I don’t know about your at-home oven, but mine is total shyte. It won’t allow me to heat from both the top and the bottom simultaneously, therefore I have to start my breads with ‘top heat’ and then switch to ‘bottom heat’ at the end of the baking process, in order to get an evening baked, evenly coloured loaf. Pay attention to these little things, they will make or break your projects! This recipe was more in depth but I’ve simplified it for the home baker, in terms and bullet points that I think make the process easier and less intimidating and confusing. The key is not to over think it too much. Bread seems complicated, but even when it’s not perfect it’s usually still fantastic to eat at home. It’s not like you’re trying to sell the thing, right? If it looks a little lumpy- knead it some more. If it looks a little pale and sickly- bake it a little longer. And the finished loaf… much more successful than I’d expected for my first try! Previous articleFoodNadege: Kouign Amann vs. Cronut. Next articleLifeCemeteries & Undergrounds: My Odd Photography Addiction. I’ve made a couple Challahs before (Tori Avey’s and Norene Gilitz’s recipes) but this starter ‘sponge’ thing is new to me. What’s the purpose? How does it change the bread as opposed to if you were just using an all-at-once recipe with active dry yeast?